The benefits of aloe water depend on the quality and amount of aloe vera juice or aloe vera gel that is added to the water. In its purest form, a small amount of the juice or gel of an edible aloe vera plant is added to clean water. 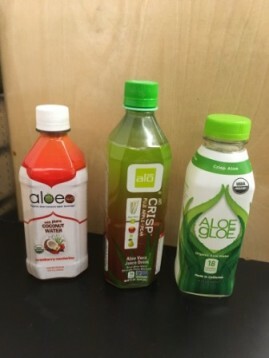 Since aloe has a very bitter, citrus flavor, most commercial brands of aloe water also add some type of sweetener, such as honey, fruit juice, stevia or sugar. Aloe vera juice or gel is taken internally most often for its anti-inflammatory and digestive benefits. Aloe also has anti-microbial benefits. It can specifically help combat microbes in the intestines, which can provide relief from gas, bloating and other irritable bowel symptoms. Aloe also supports the natural detoxification process in the body and promotes regularity. And it contains 8 essential amino acids, vitamins A, C, B, and E, as well as numerous minerals (calcium, magnesium, manganese, iron, zinc, copper, potassium, chromium). The health benefits of aloe water is somewhat dependent on the source and type you drink. The purity and potency of the aloe is the key. The water is also important and must be filtered of contaminants. 1. Commercial brands. With bottled aloe water, you have to read the lables and maybe even do a little research to find out how much (if any) of the active constituents of the aloe plant are actually in the product. Otherwise, you will be paying for an expensive bitter-tasting water with little or no health benefits. I try to stay away from commercial products like this, unless the company provides some type of verification of the purity and potency of the aloe vera that is in the product. Otherwise, you never really know what you are getting, good or bad. 2. Homemade aloe water from the plant. There are many aloe water recipes online that explain how to extract the gel of an aloe vera plant, which you can then add to clean water and make your own aloe water. However, it is important to note that not all aloe plants are edible. In fact, some are poisonous, so you better know what you are doing and the type of plant you are using and whether it has been sprayed with pesticides, and so forth. I would rather rely on companies who specialize in extracting aloe vera from the plant and have tested it it for purity and potency. 3. Homemade aloe water from bottled aloe concentrate. I like to make my own aloe water, using a high-quality aloe vera concentrate product and adding it to clean filtered water. I add 2 or 3 ounces of aloe concentrate to 8 to 12 ounces of filtered water. At times, I will add a little organic apple juice or stevia to the aloe water on occasion if I want a sweeter taste. The brands of aloe concentrate products I prefer are Country Life, Aloe Life, and Lily of the Desert. These brands provide a measurable verification in MPS (MeOh Precipitable Solids) of the potency and concentration of their product. I consider aloe vera a super food and try to keep a bottle of aloe vera concentrate in my refrigerator most of the time. Sometimes I will drink an ounce or two straight before meals to aid digestion or in between meals as an energy boost. Or I will add an ounce or two to 8 ounces of water (with or without a natural sweetener) to glean the anti-inflammatory, anti-microbial, and immune-boosting benefits of aloe water. Dr. Edward Group; Understanding Your Nutrition: What Are Polysaccharides? 2016.